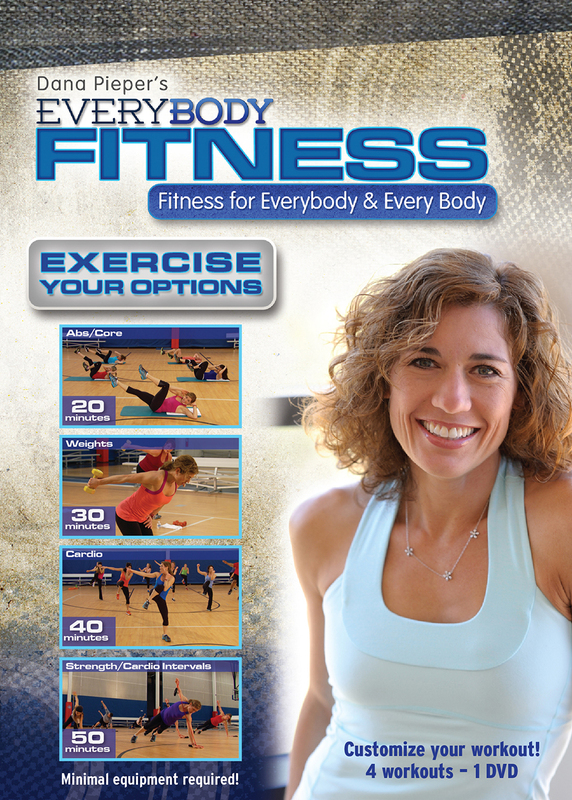 Experience the rush and the results of the EveryBody Fitness program at home, on the road…wherever you are. It’s like having Dana on demand! Videos are available in DVD format and the latest release is available as a Download!! Customize Your Workout! Choose from four great programs, or mix and match! This workout will challenge and sculpt your abdominal wall. Standing exercises as well as isometric and crunch floor combinations will tighten and shape your core. Work every muscle group using one heavy weight and a set of light hand weights. Elevate your heart rate as you build lean muscle with moves that work lower and upper body together. Get ready to sweat! This quick workout gets your heart pumping and burns calories. The fun cardio routine includes plyometrics, kickboxing, squats and lunges and more. Using nothing but elastic tubing, this killer routine delivers a head to toe workout and burns mega calories. Alternate between innovative cardio-based and strength-focused segments. Perfect for your business trip or vacation. 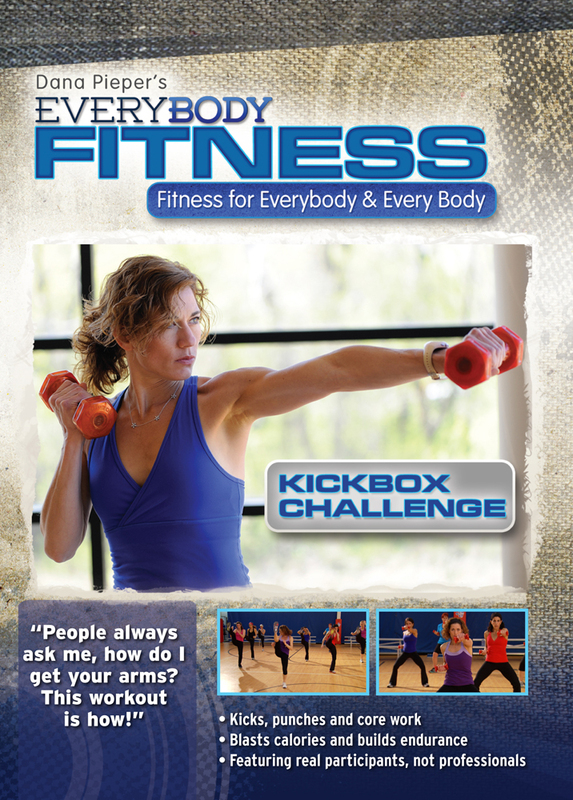 Build power and endurance with this fun, high energy program that burns calories by incorporating kicks, punches and core strength moves. This is not your run of the mill routine! Dana cleverly mixes jabs, upper cuts, hooks, roundhouse kicks and more with fleet footwork in a way that engages your body and mind. Low and high impact options offer challenges for people at all levels of fitness. Even incorporate light hand weights for added sculpting. You’ll get addicted to the adrenaline rush! An amazing head to toe workout gets you in the best shape of your life! This complete 60 minute interval workout is all you need to achieve a new level of fitness! Strength and cardio segments combine low impact, high impact, kickboxing and plyometric moves using light and heavy weights, resistance bands and a stability ball. 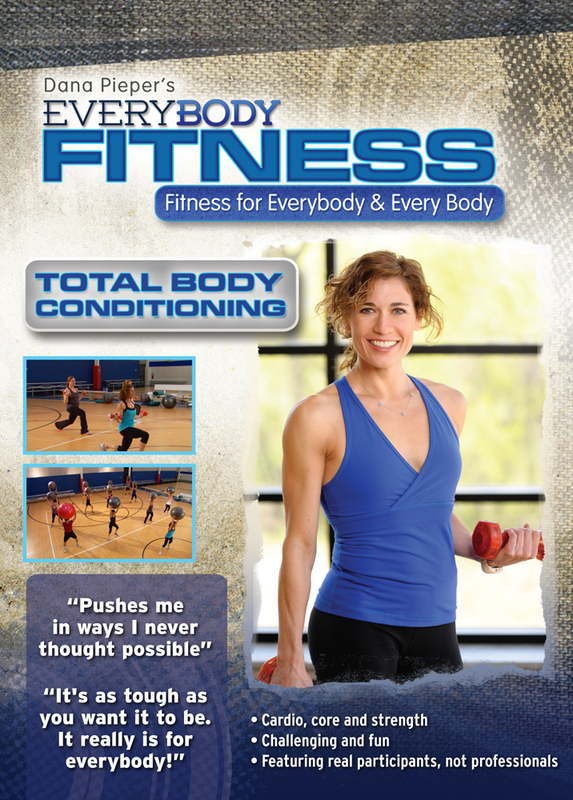 Blast fat, strengthen and tone muscles and feel incredible vitality from this all-in-one program.